Greetings fellow adopters and friends of Airedale Rescue of the Delaware Valley! With Spring around the corner and new leadership on board, we thought it would be a great time to have a rescue meeting and new volunteer meet & greet luncheon! The date will be Saturday, May 4th from 11-2 at the home of our Treasurer, Dewey Yesner in Glen Mills, PA. This will be a human only event please. We will have another event outdoors with our furry bosses invited soon. It’s been a bounty of activity so far this year with 4 intakes and 3 wonderful placements (one dog went back to his breeder per contract). We are welcoming several new volunteers to the group, new foster homes and we hope to induct some folks who have been helping on transports and the like into full volunteer status. There are positions available on the Board – Vice President, Assistant Treasurer and we are considering a few new positions based on talent (like Social Media Director). Bringing your talent to the table of a volunteer organization becomes a passion. We welcome YOU to join us in the next generation of Airedale Rescue of the Delaware Valley!! Simply email Deb Ciancarelli at deb.ciancarelli@gmail.com if you can attend either A) physically at the event or B) via Zoom. Deb will send out another email detailing the web conferencing, times, help, testing, etc. After the meeting business we will be serving lunch and will spend time meeting new friends and “talking Airedale” — as if we could help ourselves! PLUS – everyone attending in person at Dewey’s will receive some high quality samples of Freshpet! We are scheduled to receive an assortment of Freshpet’s newest product offering “Homestyle Creations” with a choice of chicken or beef patties paired with a side of ‘healthy mixers’ of fruits and veggies, with or without grains. Knowing the refined palates of the rescued Airedales, Freshpet would like our dogs’ feedback! Please visit the Freshpet website to learn about this new line of nutrition. Just a little ‘swag’ for attending – bring a cooler for your product! Dec. 10, 2018 This issue of Starting Over highlights our recent fund raising success – ARADV’s Airedale Christmas Tree raffle raised over $3,000! The raffle drawing was held during this year’s Aire Faire event on Oct. 14, 2018 and broadcast on Facebook Live. Thank you to everyone who bought tickets. You can read about the raffle and the lucky winner here. 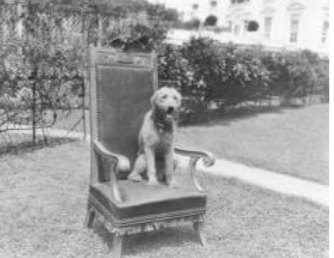 This issue also features a piece on Laddie Boy, an Airedale Terrier and the first dog of President and Mrs. Warren G. Harding. Back issues of Starting Over are also available here. Josey relaxing during rehabilitation after surgery. Aug. 10, 2018 Starting Over features a story about Josey the Airedale, who needed an expensive operation to remove a toy from his belly. His owners couldn’t afford surgery, and ARADV stepped in to help this 18-month-old bundle of energy get the care that he needed. Also included in this edition of our twice-yearly newsletter: information on keeping your dog safe this summer from ticks and rabies; updates on adopted Airedales; and the true WWII story of Ciapek, Airedale Terrier and Mascot of the Polish 305th Bomber Squadron. And, Mary Jo Johnson offers ideas on how you can volunteer to help Airedales in need in Pennsylvania, Delaware, and New Jersey. Back issues of Starting Over are also available here. Jan. 15, 2018 Our lead story follows our three-legged hero, Beau, as he gets adopted and then becomes the star of a pet food commercial! Also included in this edition of Starting Over, ARADV’s twice-yearly newsletter, are updates on other ARADV rescues, a re-cap of the 2017 Aire Faire event, a report from Alexandria, VA on the annual Scottish Walk, and an update on Libre’s Law, a bill that was signed into law that strengthened the laws in Pennsylvania protecting animals from abuse. Back issues of Starting Over are also available here. Nov. 3, 2017 Airedale Rescue and Adoption of the Delaware Valley is happy to report that this special needs boy has been adopted. Beau is two years old and is a tripod. His right rear leg was amputated when he was six months old, but he doesn’t let it slow him down. If you are interested in being considered for Airedale adoption, have a fenced yard, and live in PA, DE, or NJ, please complete an application. Read more about the very special Beau here. Nov. 1, 2017 The lovely Diva has been adopted! Diva loves life, other dogs, and even cats. She is high energy and does best as an only dog. She is housebroken and takes good care of her squeaky toys. If you are interested in being considered for Airedale adoption, have a fenced yard, and live in PA, DE, or NJ, please complete an application. Dr. Dudlee – therapy Airedale ready to start his volunteer work. Aug. 7, 2017 Read about the fantastic Dudlee Meyer, ARADV rescue and therapy dog extraordinAire. Also included in this edition of Starting Over, ARADV’s twice-yearly newsletter, are updates on ARADV rescues, information on dealing with behavioral triggers of adopted dogs, and memorials to adopted Airedales who have recently crossed the rainbow bridge. Plus, read about the “Peanut Express” – the amazing tale of Peanut the Airedale’s trip from the Beaver County Humane Society to his new forever home. ARADV volunteers traveled a total of 660 miles to save this grateful Airedale boy. Back issues of Starting Over are also available here. July 25, 2017 Read about our most recently adopted Airedales, Angel and Zoe. Visit our blog page to see a recent list of adopted dogs and “Happy Tails” – updates on our amazing rescued Airedales. As Airedales become available for adoption, we also post them to the blog page. For information on applying to adopt a rescued Airedale, please see our Adopting an Airedale page. Please note: ARADV only places dogs in Pennsylvania, New Jersey, and Delaware. If you live in another state and wish to adopt an Airedale, please go to the Airedale Terrier Club of America’s Rescue and Adoption Committee site to locate a volunteer in your area.